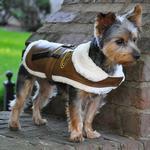 Keep your co-pilot toasty warm with our Brown and Black Faux Leather Bomber Dog Coat! Toasty faux wool shearling lining. If dog is your co-pilot, you'll love outfitting them in this classic bomber coat with vintage styling. You'll be ready for high-flying adventures with this quality jacket with designer details. This belted dog coat is made with dark brown faux leather and is accented with black faux leather pockets and belt loops. It also features an embroidered wings emblem that says "Co-Pilot" for your little co-pilot buddy. 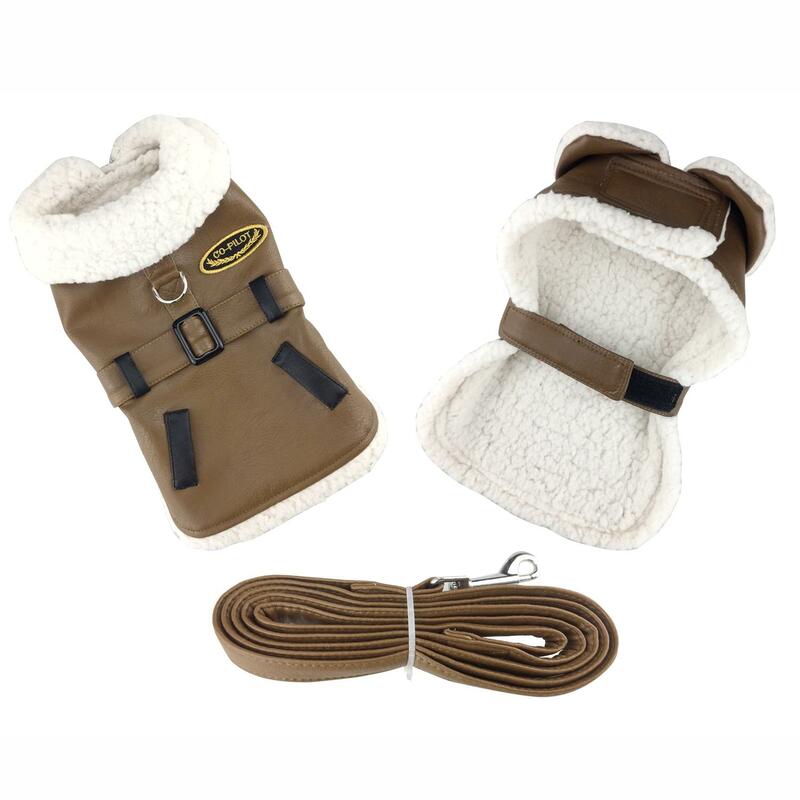 Your pup is sure to stay toasty with the faux wool shearling lining and collar. We've added a polyfill fiber liner between the outer and inner layers to guard against the coldest weather. You'll be ready to go at a moment's notice thanks to the quick touch fastener at the neck and waist. It's very easy to put on and take off. With lots of room for adjustment, your pup will get a great fit. This vintage dog bomber coat has a reinforced double box stitched D-Ring for added strength and security when using the matching leash. Brown and Black Faux Leather Bomber Dog Coat Harness and Leash by Doggie Design Customer Photos - Send us your photo! Our little guy staying warm in his new co pilot harness !! Messi is ready to be our co-pilot whether it's in a plane, car, train, etc. The bomber jacket is adorable and will keep him toasty warm this winter on his long hikes around the lake in our community! He loves it! Benjamin looks so cute in his Co-Pilot jacket! Posted On 12/10/18 by Central City from Central City, KY Yes, Central City recommends this product! This runs really small compared to the other Doggie Design coats. I returned because it was too short on the sides and back and had to pay for return postage. Not happy about that at all. It's been a cold winter here in NYC and I purchased two of these for my 2 boys and this morning I see that the material is coming apart around the leash catch. Posted On 12/08/17 by Eileen G from Cleveland, OH Yes, Eileen G recommends this product! I was so please with this adorable coat for my Izzy. The quality is exceptional, the sale price was awesome. I got the XXLarge for my dog and fits just right. I love that I can put her harness on 1st and the coat over it since there is a hole in the back for the leash. Order it on Tuesday and received it on Thursday another nice bonus! Posted On 01/10/17 by Patty S from medford, NJ Yes, Patty S recommends this product! Lots of compliments, Benny the yorkie seems to like wearing it, but Velcro is not strong and even a 7 pound yorkie can wriggle out of it if he pulls on his leash hard enough. Posted On 12/26/16 by Diane from Prior Lake, MN Yes, Diane recommends this product! The coat is adorable and looks as pictured. It does seem to run a little small. It's a bit stiff but hopefully will soften up with use. I always try to find coats that have the harness feature as I don't like to attach the leash to my little one's collar. Size for Samson - Brown bomber jacket. Posted On 12/25/16 by Robin Young from Old Hickory, TN Yes, Robin Young recommends this product! Ordered XXL for my large mastiff/pit bull mix. Just wish you made one size larger. It ran a little small, but happy with quality and cute matching leash. Big dogs deserve the best coats available too! Posted On 12/17/16 by Becky C from New Albany , IN Yes, Becky C recommends this product! So cute but too big for my Tea Cup size Yorkie. I bought all my Yorkie clothes here but the XXS is too big. He weighs less than 3 lbs, will be only 2 lbs at the most. Don't you have clothes for 'Tes cup' size Yorkie's? Posted On 12/17/16 by Ashley J from , CO Yes, Ashley J recommends this product! Perfect for the cold weather months...my pup will stay warm. Glad to finally find a coat that got and allows him to move about normally. It's not just cute. It's warm and well made too. Posted On 12/14/16 by Mark R from Austin, TX Yes, Mark R recommends this product! I ordered this on a lark because we are taking our first flight together over the holidays. I expected a cute bomber jacket and it *IS* that. But the faux leather looks real, feels plush, and the fleece is thick and warm. What a great surprise at this price! My Cavalier boy looks very manly in this adorable coat. It fits him well and is very cute. Posted On 12/06/16 by lesley b from pemberville, OH Yes, lesley b recommends this product! I ordered a small according to the sizing instructions but regret too big. My chihuahua has shallow depth front chest area and the wrap around at front neck came too far down over top of her legs and buckled her legs when she tried to walk. Apart from that, it is a great coat, easy on and off and she looked so cute in it. I will send it back but don't know if I will reorder a smaller size because I don't think it will fix the problem and by the time I keep returning them it will cost too much. Posted On 12/06/16 by D.C. m from Beacon, NY Yes, D.C. m recommends this product! This harness is very stylish and fits our dog perfectly. The lining is keeping him warm on the chilly nights too ! Posted On 12/05/16 by Joanne G from W Bloomfield, MI Yes, Joanne G recommends this product! Posted On 11/24/16 by Karen C from Castleton, VT Yes, Karen C recommends this product! This is the second bomber jacket we bought for Beau. His dad was in the air force during the Korean war, so he loves to put this jacket on him. I am getting a spare just in case anything happens to the other one. His dad and Beau would be heartbroken. Posted On 11/20/16 by Arlene C from Crest Hill , IL Yes, Arlene C recommends this product! I loved the coat, it was so cool! But it was too long for my dog because her chest size is 17" but her length is only 10". I was sad I couldn't keep it I had to return it. Posted On 11/19/16 by Pamela G from Rancho Murieta, CA Yes, Pamela G recommends this product! It's made very well. And, it looks adorable on my dog! Every dog should have one. It will keep him very warm! Posted On 11/17/16 by Lisa G from Lubbock, TX Yes, Lisa G recommends this product! Purchased a small for my little 5 pound rescue yorkie/chi mix and it is a little long and loose but may be perfect when he gets a bit bigger. 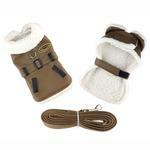 The material is soft and it has a fleece lining that should keep his skinny body warm this winter. Also has a d ring which is perfect to attach the included leash. Got it on sale so it was a bargain! Posted On 11/16/16 by Daenerys from Dayton, OH Yes, Daenerys recommends this product! It's cute and well made, the strap that goes around the tummy is a little snug though. Posted On 11/10/16 by Lori S from Hamden, CT Yes, Lori S recommends this product! Coat is well made and looks warm It fits well and is easy to put on. I love the hook on the back of the coat where we can hook the leash that comes with the coat. Posted On 11/01/16 by Marilyn D from , OH Yes, Marilyn D recommends this product! My dog is 12lbs and the medium fits him just right. he's styling with the aviator jacket and matching hat. I love the leash that comes with it. love the faux leather look! I love the styling of this coat. The brown leather is soft and slightly distressed and the faux shearling collar makes it look so good! It is easy to put on with just two velcro straps. I will exchange for a size up because it runs a bit short in the length for my dog. Posted On 10/26/16 by Stephanie B from Washington, PA Yes, Stephanie B recommends this product! Like!! This fits my dog awkwardly and slips to the side when he moves from the leash. Posted On 09/24/16 by Amy L from , OH Yes, Amy L recommends this product! Nicely made ...love it. Too Cute!! Posted On 09/14/16 by Karen R from Utica, IL Yes, Karen R recommends this product! ADORABLE! However, I got a size medium for my Cavalier King Charles Spaniel and I had to exchange it for a large. I got a small for the aviator hat (also adorable) and I should have gotten a medium. The small just barely fits. Both are just darling and I can't wait for us to strut our stuff at the costume party at the show we will be attending. Posted On 08/08/16 by Fred H from Eugene, OR Yes, Fred H recommends this product! Not only is this harness authentic looking, but it comes with a matching leash. It is also warm enough for cooler weather. This is just one of many Doggie Design harnesses we have purchased through the years because of their design, quality, and fit! Posted On 03/11/16 by loril m from NYC, NY Yes, loril m recommends this product! Snappy jacket. Well made and good looking. My small Yorkie looks so great and will be so warm when the weather changes again. Posted On 03/11/16 by Madison M from Richland hills, TX Yes, Madison M recommends this product! Posted On 02/03/16 by Katherine M from Boca Raton, FL Yes, Katherine M recommends this product! My little guy looks great in this jacket! Very true to size and looks like real leather. Would highly recommend this jacket. Posted On 01/06/16 by Cynthia E from Weatherford, TX Yes, Cynthia E recommends this product! When I saw this awesome Co-pilot harness, I knew I had to purchase it for our mini male Yorkie. My husband is a former military pilot and he loves this harness! My husband puts this cute harness on our Yorkie every time he takes him out shopping. They get numerous compliments each trip. Posted On 11/16/15 by Gail D from New york, NY Yes, Gail D recommends this product! This is so adorable on our little Chorkie! It is hip and comfortable with a stand up collar that adds to the warmth. Plus as a harness it works well with Velcro closures at the neck and belly. Posted On 10/16/15 by val m from Apex, NC Yes, val m recommends this product! My boy, Zuc, loves to be dressed and wears his clothes well. I bought this jacket to make sure he is warm enough, and I was pleased with the thickness and weight. Zuc loves to come in the car with me when I run errands. I always call him my copilot. When his jacket arrived, I couldn't believe what the patch on it said, you guessed it, COPILOT! I feel that it was a good value for the cost. Posted On 09/22/15 by Cijai B from cave creek, AZ Yes, Cijai B recommends this product! Posted On 09/17/15 by Nancy S from Chicago, IL Yes, Nancy S recommends this product! Tim looks like a WWII flying ace in his bomber jacket. The attention to detail is fantastic! I can't wait for the cold weather so he can WOW the female dogs in the neighborhood. It fits close to measurements given. Allow for it to be a little on the big size which is good. Since measurements are close, it is not too tight. Posted On 09/17/15 by Sheila S from Warsaw, IN Yes, Sheila S recommends this product! When, I first ordered this jacket, I thought,I had.made A mistake. The price was to good to be true! But let me tell you what; my pretty lady looks nice and warm and ready to ride! It fits her perfectly it's warm, heavy, and I am thrilled with my purchase! Thanks! Baxter Boo definitely scored big with this poor lady that has expensive taste. GOOD BLESS YOU! Sincerely Sheila, And of course the show stopper herself; Autumn Rose. It's wee hours in the morning and she's laying here sawing logs. But, I REALLY was hoping to ask if you would post A picture of her in it! She looks so cool man. Posted On 08/29/15 by DONNA N from amherst, NY Yes, DONNA N recommends this product! My dog usually wears a medium but he needed a large in this. It is well made and solid. It comes with a matching leash and has a D ring so it is a harness. It is really thick and warm. I love it! Easy shop to navigate. Found just what I was looking for.